Hurricane Bud is churning off the coast of western Mexico in the Pacific Ocean Tuesday as a Category 3 hurricane with winds of 125 mph. Add Hurricanes as an interest to stay up to date on the latest Hurricanes news, video, and analysis from ABC News. 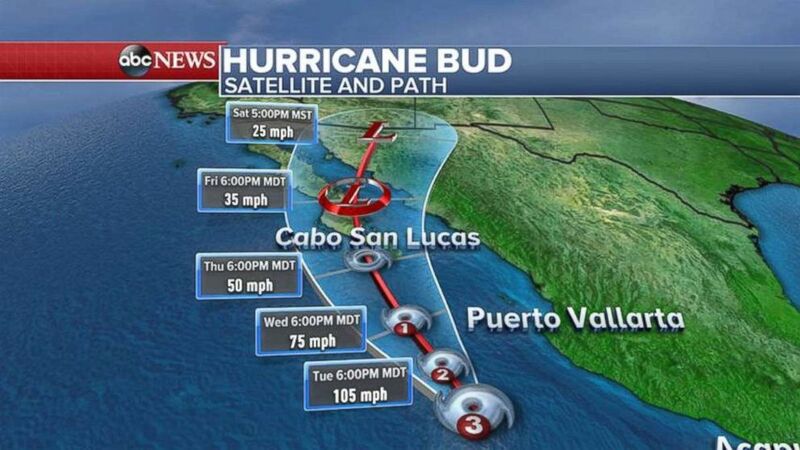 Bud is located about 325 miles southeast of Cabo San Lucas. 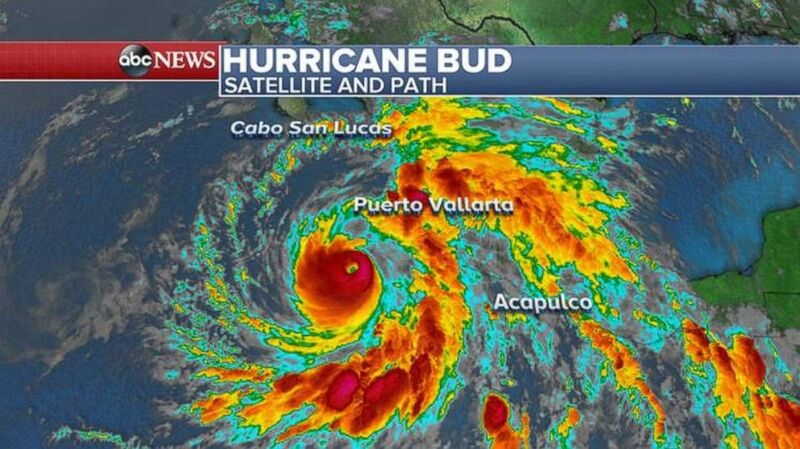 Bud is passing safely west of Puerto Vallarta on its way to hit Baja California sometime on Thursday. The good news is that Bud will begin weakening later today as it encounters cooler waters. Hurricane Bud is churning in the Pacific, off the coast of Mexico, on Tuesday morning. At the moment, there are no watches or warnings along Mexican coast, but this could change as Bud approaches the Baja by the middle and end of the week. The outer bands of Bud will bring heavy rain to western coast of Mexico today, some areas could see up to 10 inches. Bud’s track shows it making landfall on Friday. 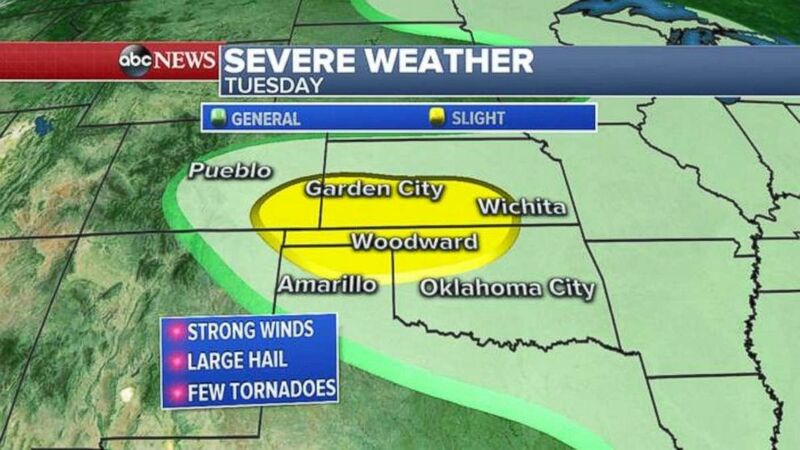 Severe weather will be found Tuesday throughout the southern Plains — from Oklahoma into the Texas Panhandle, Kansas and into eastern Colorado. The biggest threat will be damaging winds and hail, but an isolated tornado is possible. Severe weather could hit northern Texas, Oklahoma and Nebraska on Tuesday. The severe thunderstorm threat will move into the Northeast from New York to West Virginia on Wednesday. The biggest threat will be damaging winds, some hail and isolated tornadoes. 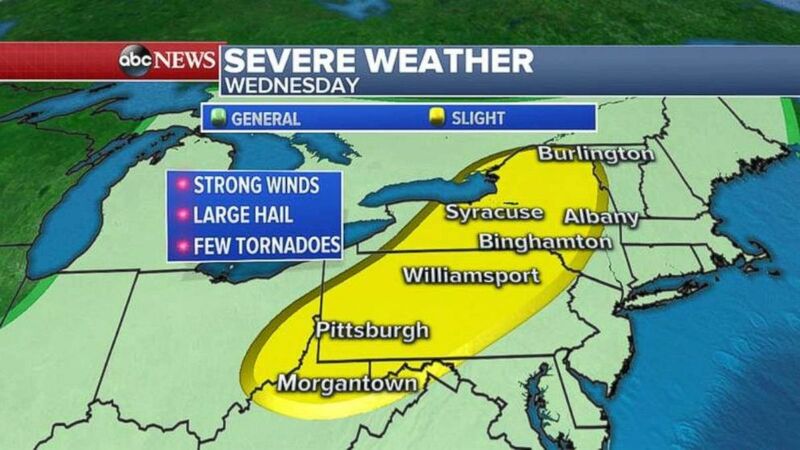 There is a possibility for severe weather on Wednesday throughout Pennsylvania and western and northern New York.